This is the first post in a new series interviewing some of the highest rated suppliers in the Web Retailer directory. I spoke to Abbas Tharkar, Founder of eBay and Magento design company dZine-Hub. We talked about what’s changed in eBay design over the years, getting eBay designs to work on mobile phones, and the challenge of extracting product data from eBay listings. Andy: How did the business get started? Abbas: Initially I started out consulting for a client selling mobile accessories on eBay, and actually went on to own the business. This was back in 2008 when the market was getting saturated, and we were selling around £10,000 – £15,000 a month. That’s when we saw the opportunity helping people set up their eBay business. I come from a technical background and always felt we would get back to that technical domain. We were just designing eBay templates initially, at least for our first 100 projects. Back then these were really basic templates without the eBay API, or any special features. Later we branched out into more advanced eBay consulting, helping clients set up listings on eBay, handling eBay data and so on. What services do you offer today? Has it expanded beyond eBay? The eBay design service has grown by leaps and bounds. We now have around twenty team members in Manchester (UK), Melbourne (Australia) and India. We’ve got dozens of different eBay listing add-ons and widgets now, many of them controlled by the eBay API and displaying scrollers, galleries, best sellers and new products for example. They give customers better ways to access a seller’s products and understand the entire inventory, so the seller can market their products better. They really help with cross-selling and increasing sales. Apart from that we do eBay data services where we help clients migrate from one platform onto eBay, or from eBay onto another platform, like an ecommerce site. We help sellers list hundreds or thousands of items from their suppliers or manufacturers. That can include auto part compatibility, multiple variations, multiple images, and ensuring the entire store is set up with a custom design and with data from different services. For example, imagine you’ve got tens of thousands of products, and want to migrate them from eBay to a website. We help migrating the items, taking all the old listings and converting them to the new template. Some can be done automatically but in most cases you have to clean the data because the existing listings will contain policies, payment details, gallery widgets and so on. We clean that off, take the actual item description, and put it inside the new template. We use a combination of the eBay API, Excel macros, data mining and so on. It’s partly manual and partly automated. We have also started offering Magento design and development and have delivered 160 ecommerce businesses on the Magento platform in the last two and a half years. We have developed a handful of eBay Enterprise Template Stores (ETS) for fashion brands as well. Why do sellers want a custom design? How does it benefit them, or what problem does it address? When you sign up for an eBay store, it looks plain. It’s very difficult to differentiate yourself from the other sellers. We help them put a brand on eBay, to brand their business and stand out more professionally compared to their competitors, and help with strategy as well. The biggest problem what we help solve is ensuring their products are displayed better, and their listings are more compatible with mobile – making the images suited for the device they’re being viewed on. We just ensure the business has a good branding and the products are presented beautifully. It’s difficult to measure the percentage increase in sales because sales depend on a lot of factors. It could the season, adding more inventory, or the type of product. For one seller we designed a template and sales increased more than 1,500%. But that’s not just because of our template. It does give you a good presence though. Your listings look professional with all your policies laid out neatly, a good business branding, and a lot of ways to cross-promote products in a single seamless template. That’s definitely going to look a lot more professional than a default eBay listing. There’s a lot of companies offering eBay design now, is there something different about the way you do it? Yes. We do not tie them down, number one. We don’t tie them down to any particular software. We ensure our designs are compatible with just about any software – inkFrog, Auctiva, Volo, ChannelGrabber, Brightpearl, ChannelAdvisor, SixBit or just about any software. We also do not charge a recurring fee to host their files, we just transfer all the graphic files to their hosting account using their FTP details. So they’ve got the freedom to host their own files and they’ve got the freedom to use any eBay seller tool out there in the market. Number two, we try to provide the best support services in terms of being accessible through Skype, live chat, telephone, Google chat or email. We make at least three or four different members from our team accessible to our clients, so if one of us is busy somebody else can always talk to the client and get their requirements. It makes it easy for our clients to reach out to us. Thirdly, we follow agile project methodology where we ensure we have a quick turnaround time of about a day every time you need any change. So our average project completion time is a couple of weeks – in about two weeks you have your store up and running. Do you have a typical customer who is best suited to your company? For eBay design services we cater to almost every single customer out there. We’ve had some really small businesses, all the way up to three of the top five eBay businesses in Australia. We’ve completed close to about 1,250 eBay projects, across every single category from automobiles to fashion and car parts. It’s different when it comes to Magento development where we prefer catering to SMEs (small to medium enterprises). 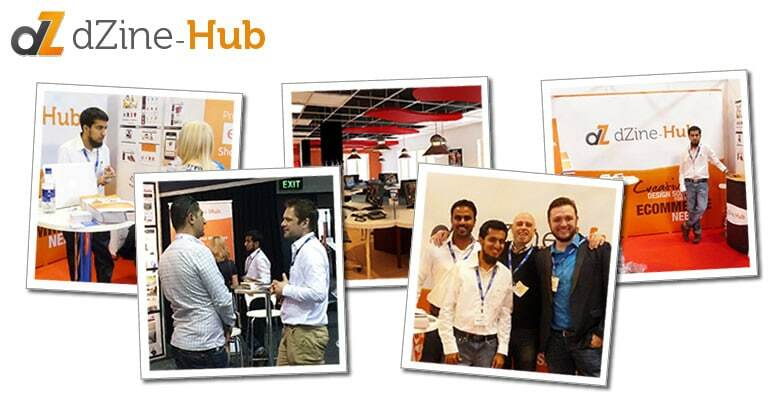 Why do you find SMEs to be the right kind of customer for your Magento work? Magento caters to businesses of any size, but enterprise businesses require a lot of custom development, and the projects take longer. Magento is an entire e-commerce system and no single company can cater to clients of every size. You’re looking at lead times of about three months to set up a Magento website for SMEs, but for large enterprises it’s going to take a lot more time, and a lot of custom development. In the future we can always expand. Going back to eBay designs, how would you say the designs have changed over the years you’ve been doing it? eBay design is like a subset of website design. The trends and practices in website design get translated over. In the last five years it’s changed from a basic logo, to responsive design that fits across every device. Some sellers have really complex designs for the desktop but when you view them on your mobile they’re going to be completely responsive, with a simple mobile version. That’s pretty complex compared to what things were four or five years back. So do all the widgets and advanced features all get removed on a mobile phone? You can choose to keep them, but essentially the whole world of mobile is about cutting down information. So we take off the widgets, or make them as little as possible, and focus on the three most important attributes: title, images and description. It’s up to the client to decide how many widgets they need for mobile, but we recommend keeping them to an absolute minimum. Most of the widgets have a mobile version that works OK, but we don’t want buyers to have to scroll a long way past lots of widgets. So is it worth having a custom design if a lot of people are using mobiles and most of the design gets removed? There are two parts to that. Number one, it’s useful to have a design on the mobile because when you click the description tab in an eBay app or from a browser it doesn’t show your product title or image. You’ve got to click the back button and then click again on the title or image. And then back again to click on the description. There’s no single place to view the image and the description together. In our mobile templates we display it all together so you just have to scroll a little. Number two, it’s not that most of the design is removed, it’s still going to have the same branding and the same feel. Every mobile template we do has the same style as the desktop template, with the business branding, logo and so on. You can retain most of the design but we try to make it more subtle, and focus on the text and description. 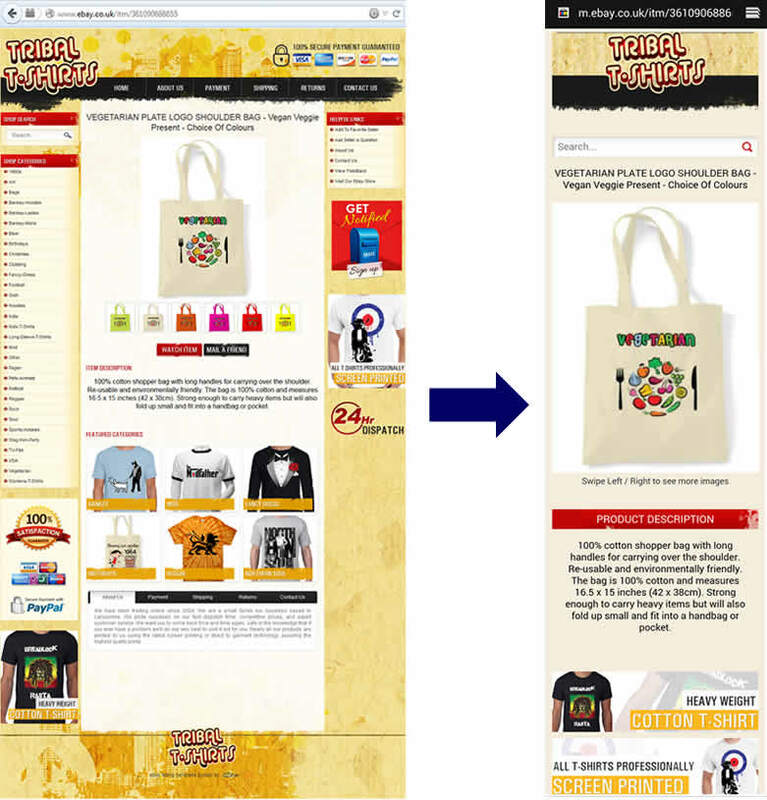 Below is an example of responsive eBay design. This is exactly the same listing, viewed on a desktop PC on the left and a mobile phone on the right. And there’s still a lot of people who aren’t using mobile devices to browse, or who use a laptop or tablet as well as a mobile, so the full rich design is still shown to them? Yeah. That’s right. I would say more than rich, it’s a functional design for displaying content and conveying information effectively. There’s more content in the desktop design which has to be presented in an apt way. It’s about rearranging this content in your mobile, so that is a challenge in coming up with an effective responsive mobile design. It’s not exactly cutting down information on the mobile, rather rearranging and positioning it differently so that your font size is still readable. Are the eBay mobile apps different from the eBay mobile website? Does it make a difference to how you design? No, not at all. Essentially the eBay mobile app internally uses a web browser, so it functions exactly the same way as Chrome, Firefox or Opera on a mobile phone or even Internet Explorer on your Windows phone. All of these will perform the same if you have a template that is designed to the highest HTML and CSS standards. It’s so essential for sellers to look at the portfolio of eBay store designers and take a look at the live eBay listings on mobile to ensure they’ve got the expertise to design for mobile across all platforms. At least ask companies for a few samples of their mobile compatible designs and then check them on your mobile phone. Moving away from mobile, what are some of the widgets you have and what do they do? We have a related items widget, which dynamically shows other items from the same category that the item is listed in. That helps with cross-promotion. It’s completely automatic so saves time linking items manually. Another widget shows items that are either ending soon or newly listed. All the widgets are controlled using the eBay API and add content to your template – you come across as a seller who’s got a lot more products in your inventory. Another one is “Deal of the Day” which you can use to promote special offers from within your eBay description. It does not interfere with the actual item description because you can put it lower down or along the side. And then we’ve got loads of add-ons to display best sellers. We also have mega menus, which enable you to show a lot of categories and subcategories. They work well if you have just a few level one categories, but plenty of level two and level three categories. It’s not wise to show them all on the left hand side in a long column from top to bottom. Instead, you display level one categories as a horizontal menu. Then when you hover over level one it drops down as a big menu with the level twos and threes and some images inside. It’s similar to the main Amazon toolbar and makes your eBay design look like an ecommerce website. If you are a large enterprise seller then we’ve got dropdowns, dependent search boxes, and independent search boxes. For example, if you are selling auto parts then you may need to have a box for vehicle make, model and year. Where when you click on the make, the model dropdown gets populated. What have you got planned for the future? Any new services or widgets? We won’t be moving away from eBay and Magento, just building more expertise on both those platforms. From what we’ve seen, they have massive potential. We’ll keep enhancing our expertise, portfolio, and service offering in these two main services, with Magento taking the driver’s seat of late. How can sellers learn more about your company without getting into a sales process? Most of the information is on our website. They can always drop us an email and we’ll send them a specific product brochure, proposals and information about how we’ve done our recent work. Our website is a good place to start from and get some more information. Look at our portfolio for eBay. For Magento, it’s best to contact us because it’s an education based-process. They both work really differently when it comes to offering them as a service. Thank you Abbas for taking the time to share so much about your business with me and Web Retailer readers. I hope you’ve enjoyed this article and found it useful. I’d love to hear any comments you have below.